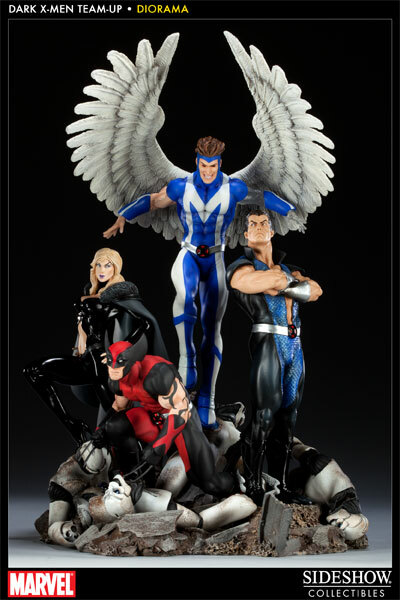 Order the Dark X-Men Diorama today! In the Marvel comics, as the event called Secret Invasion came to an end, Norman Osborn came into political power. He replaced the group known as S.H.I.E.L.D. with his own organization, H.A.M.M.E.R. This period was known as Dark Reign. During the Dark Reign, Osborn also supplanted some superhero groups with groups of his own construct. One of these was the Dark X-Men. The members of the Dark X-Men were Emma Frost, Namor the Sub-Mariner, Mimic, and Daken — son of Wolverine. This diorama features the dark team in all its shadowed fierceness. The Sideshow Collectibles team behind this design — Martin Canale (Sculpt), Mireya Romo Bowen (Paint) and Kristafer Anka (Design). The statue stands 16″ high. Mimic, who has the power to “mimic” the original X-Men’s powers, has alternate interchangeable pieces. His arms can be changed out to Iceman arms, and his head has a replacement featuring glowing Cyclops eyes.